How to Prevent a Massacre? Somebody Needs to Figure It Out. Twenty-seven people dead today, mostly children. It is impossible to comprehend the horror of your small child being shot down like an animation in a video game. 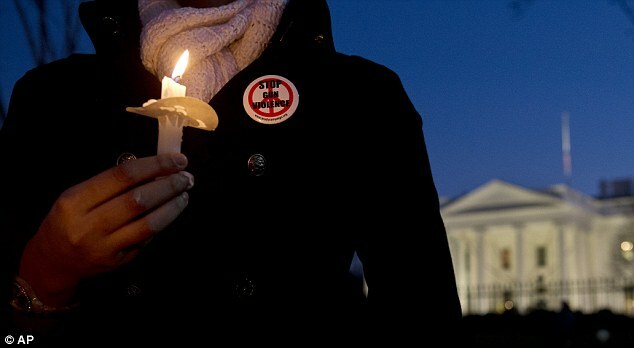 Gun control advocate wearing badge against gun violence outside the White House. AP Photo. Being able buy a gun, ammunition and liquor at the same checkout. Playing video games 4 to 16 hours a day that feature human targets as scoring incentives. Undiagnosed/untreated learning and/or emotional disabilities. Lack of meaningful involvement in both household and community routine. Or perhaps it was none of the above. Maybe it was just the comprehension of life as another ‘game’ and the perpetrator was just looking to place as high scorer. Interesting how these shooters include suicide in the plan. I say ‘plan’ because what they do takes time and preparation: acquiring weaponry, ammunition. Choosing a day, time and place, along with point of entry. Not to mention psyching oneself up for the event. Are there no warning signs? No behavioural clues? Can’t anyone tell us what to look for? Who should have known this was about to happen? Were his parents aware of his weapons cache? Did people know this man was a ticking time bomb? Is it really true that nothing can be done until somebody gets hurt? ?